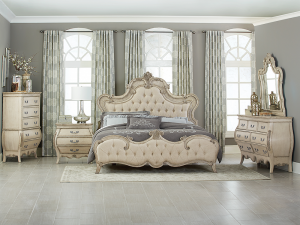 Crafted with refined Hollywood Glam styling, this alluring collection incorporates tufted upholstery, chromed-nickel hardware and Neopolitan marble accents. 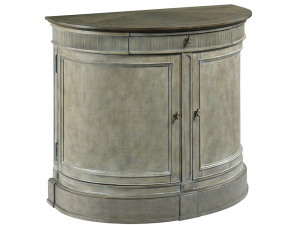 The collection also features sweeping curves and raised moldings that are emboldened with a striking finish that has been gently aged with warm glazing and texture. 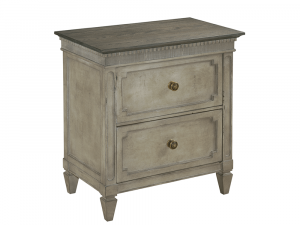 The handsome Night Stand has a gently curved serpentine front while the body has been glazed and gently aged for a soft sheen. 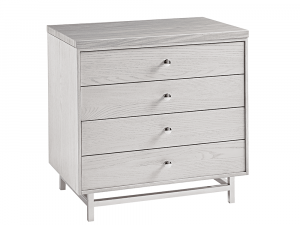 The chest features tapered legs and three roomy drawers. Constructed with Parrawood solids and Primavera Veneer. Silver Bezel, gold-leafing and chromed-nickel hardware. 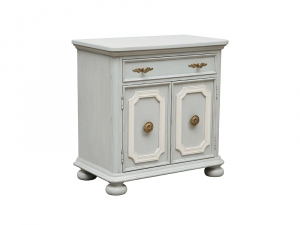 The Open Night Stand has been glazed and gently aged for a soft sheen. 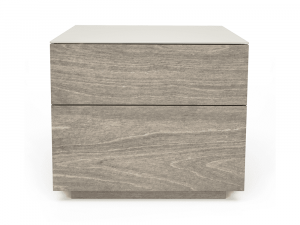 The Night Stand features a single drawer and a generously sized open cabinet, plus a hidden USB port in back. 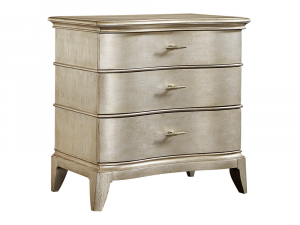 Silver Bezel, gold-leafing, and chromed-nickel hardware complete the look. 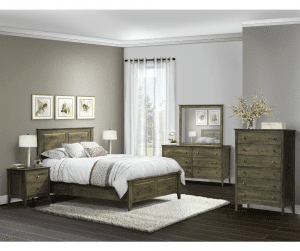 Simply sublime and proudly made in Canada, this transitional bedroom collection is made with expert craftsmanship in solid birch woods; featuring drawers with dovetail construction and smooth quadro slides. 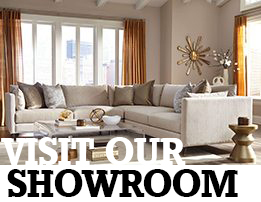 Available in alternate wood finishes and custom hardware selections to easily make your room stunning. 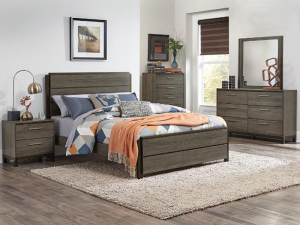 The contemporary styling of this daring collection provides a unique platform, featuring rich textures and clean lines, that will effortlessly enhance the atmosphere of your bedroom. Base rails of the case pieces are Dark Brown to contrast with the finish. 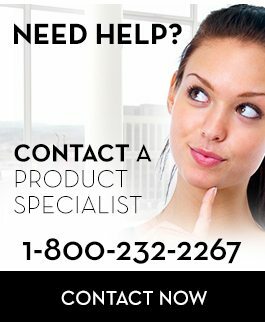 Designed with a modern angular look. Enhanced by horizontal brushed nickel hardware. 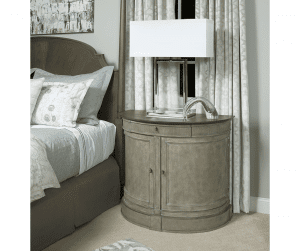 Displaying style and flair though elegant curves and feathered scroll carvings, this romantic collection is brimming with decorative accents; providing a set of furniture that will perfectly complement your personal taste. 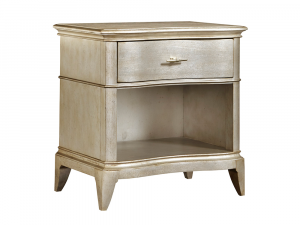 Crafted with pine solids and tropical veneers. 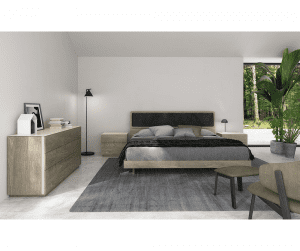 Inspired by Scandinavian style furniture, this stunning collection boasts simple clean lines, framing pieces that are easy to mix and match with other furniture, to create a look that feels youthful and organic. Crafted with solid Canadian Birch. 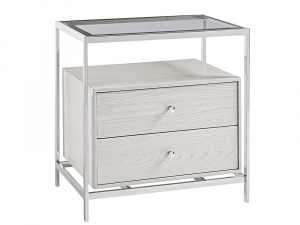 The nightstand features an acid etched clay lacquered glass tops and matching etched glass inserts that run vertically along the sides. 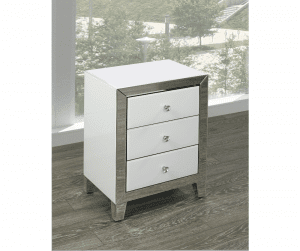 The inserts are slightly indented and serve as drawer pulls. 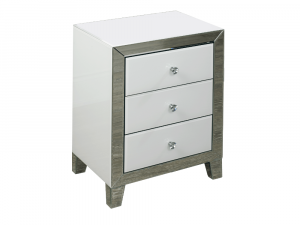 Available to order with alternate birch finishes and colours for acid-etched lacquered glass tops. 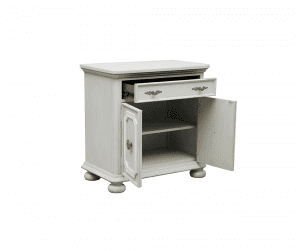 Two drawers with adjustable levelers. Recessed area in back with a two outlet plug & usb port. Expert craftsmanship and flawless architecture produce a stunning collection defined by simple case pieces and gorgeous wood grain details. 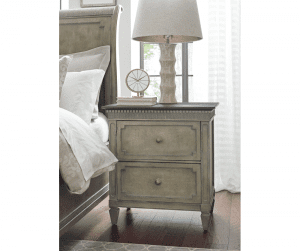 With roots in European traditional styles, this exquisite bedroom collection is a warm and casual rendition, with the look of a cherished heirloom, for today’s living. 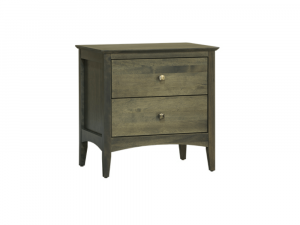 Crafted with select hardwood solids. One drawer with felt bottom.